The Battle of Bentonville has become one of the forgotten battles of the Civil War. It became overshadowed by other major events such as the surrender of Robert E. Lee’s Army of Northern Virginia and the assassination of President Lincoln. 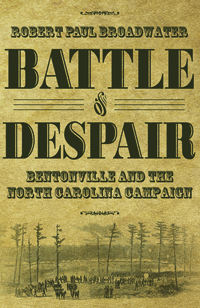 Battle of Despair: Bentonville and the North Carolina Campaign chronicles the skirmishes and battles between the Union and Confederate forces under General William T. Sherman and General Joseph E. Johnston, respectively, that led to the ultimate capitulation of Johnston’s army. The book relies heavily upon first-person accounts of the battle, with much of the action being related through the words of the actual participants. Battle of Despair examines Johnston’s struggle to create an army with which to oppose Sherman, the long odds Johnston faced, and the eventual surrender of that army—the largest body of Confederate men to surrender at the end of the war.